If you had asked me to define “Game Supper” before I moved to Vermont 14 years ago, I probably would’ve guessed a potluck involving Scrabble, or possibly Bridge. Not only was I a “city mouse,” but I had been a devoted vegetarian for over a decade. To me, “game” meant only one thing: Monopoly. I can imagine how horrified that version of me would’ve been- the me who insisted that our sit-down wedding dinner for one hundred consist entirely of vegetables and fish- to encounter the amazing annual phenomenon that is the local Game Supper. Lucky for me, I’m a carnivore now. These days our whole family looks forward to enjoying the spoils of the hunt even though we didn’t get up at the crack of dawn to go sit in a cold tree stand sprinkled with deer urine for several hours. Then again, who knows? At the rate we’re going, maybe in another ten years we’ll be doing that too. Every November (read: deer season) each town around here has their own Game Supper benefitting deserving local causes such as the volunteer fire department and the sixth grade annual field trip to Boston. 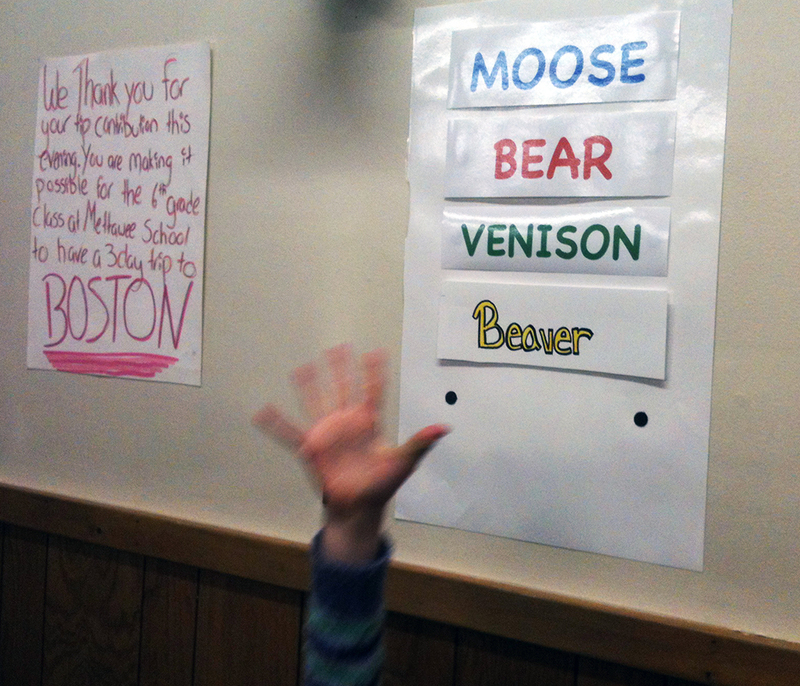 We’ve been to the Pawlet Game Supper for the last few years and the menu is reliable: Moose Meatballs (the whole reason to go), Bear Steak (to say you’ve had it), Chicken and Biscuits (for the very squeamish,) and Venison, Venison, Venison. Venison Stew, Venison Steak, Venison Sausage, and if you’re in luck maybe Gib made his famous Venison Salami- only one piece per customer please, supplies are limited. Of course there are sides- mashed potatoes and squash- if you have any room left on your plate, which you won’t. Salads, rolls and paper plates filled with cocktail-sized blocks of Vermont cheddar wait on the tables once you’re done running the buffet line. And if you’re still hungry- which you won’t be- and still eating sugar, there’s always the football-field sized dessert table, with slices of apple, lemon merengue and chocolate pie making kids drool from all the way over by the fire exit sign. 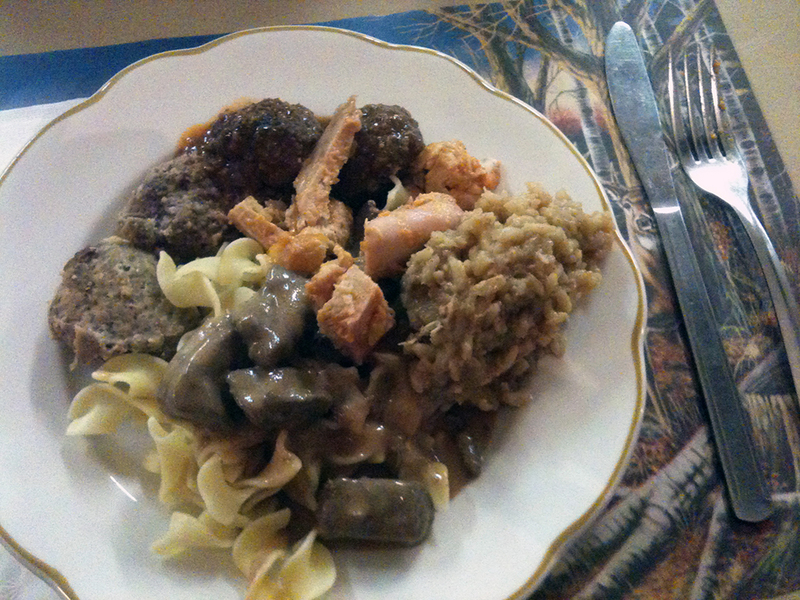 But the word on the street was that “Rupert’s Game Supper is better.” So this year it was time to check that one out too. Which is how I came to try beaver. It’s also how I came to spit beaver out into my napkin .0395 seconds later. If anyone ever asks you to define what “gamey” tastes like, you should send them to try a nice dish of beaver. One friend remarked that eating beaver is like “eating an oil slick” and I have to say I couldn’t agree more. But I tried it. Another key difference between Pawlet and Rupert’s suppers is that they wear funny hats at the Rupert Game Supper- antler headbands, chicken hats, sombreros- you name it. Nobody I asked knew why. This year, however, I had a whole new appreciation for our Game Suppers as the one local event we could attend with confidence in our Year of No Sugar. The distinctions were crystal clear, with one or two exceptions: the meat was on one side of the room, and the sugar was on the other. After all the back handsprings we’ve done to ferret out fructose this year, the clarity of this division was quite comforting. Which returns me to an increasingly familiar refrain: the idea of going back in time a bit in order to avoid the health impacts our over-processed, over-convenient lifestyle has bestowed upon us. There is a point at which all these hippy-dippy themes- no sugar, no plastics, no pesticides, eat local- start to converge; suddenly we begin to see what it is we’re driving at- what great-grandma used to cook. 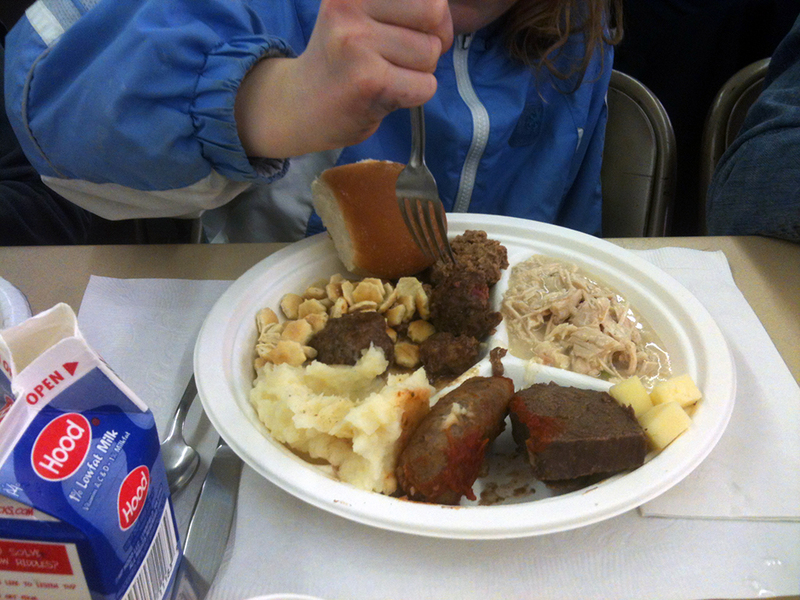 And much of it looked a lot like the Game Supper. Although I’m pretty sure Great-Grandma never wore a funny hat. You are currently reading A Year Of No Sugar: Post 84 at Eve O. Schaub.